Can you believe this is all I have to show for 9hrs of scrapping??? AND I just realised I didn't even add a title! Will be adding that shortly! LOL! Erin loves watching in the Night Garden, and loves singing and dancing to the "Upsy Daisy" song! 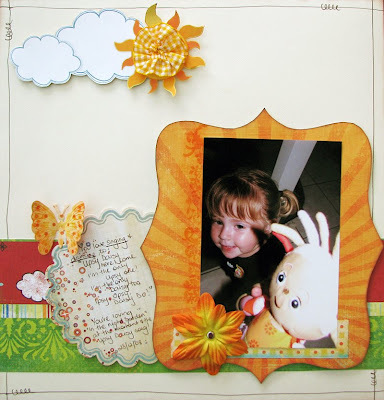 I used the new Fancy Pants Summer range, along with a cute little butterfly thanks to Mel's new Spellbinder and Leone's Cuttlebug! I also used my new Heidi Swapp mask (not as a mask, but as a template), and a cute little checked ribbon I got from the bargain bin at Spotlight on Friday! It's a gorgeous gorgeous page! Well done on completing it. WOW!! That is just AWESOME Leah. So what if it took you hours to do it - it was worth it. It has such a fresh feel about it. Well done!